Again, I'm sitting through the Webcast more in the interest of general education and keeping current for my consulting practice, and not expecting ANYTHING directly related to printing to come up. But, BINGO, less than 10 minutes in, among the first graphics presented by Forrester's Young, is a screen shot of Vince Ferraro's LaserJet Blog! 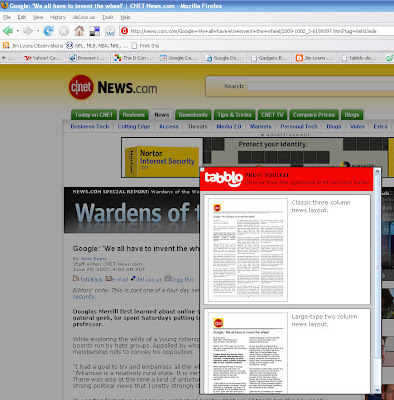 It's being held up as an example as how corporations are using blogs as a key communications tool with their customers. I must say it's nice to be associated with such a trend-setting blog, as I've been a guest blogger for Vince and have cross-linked numerous times, including Vince's Web Printing post from last week, Helping You Print from the Web. 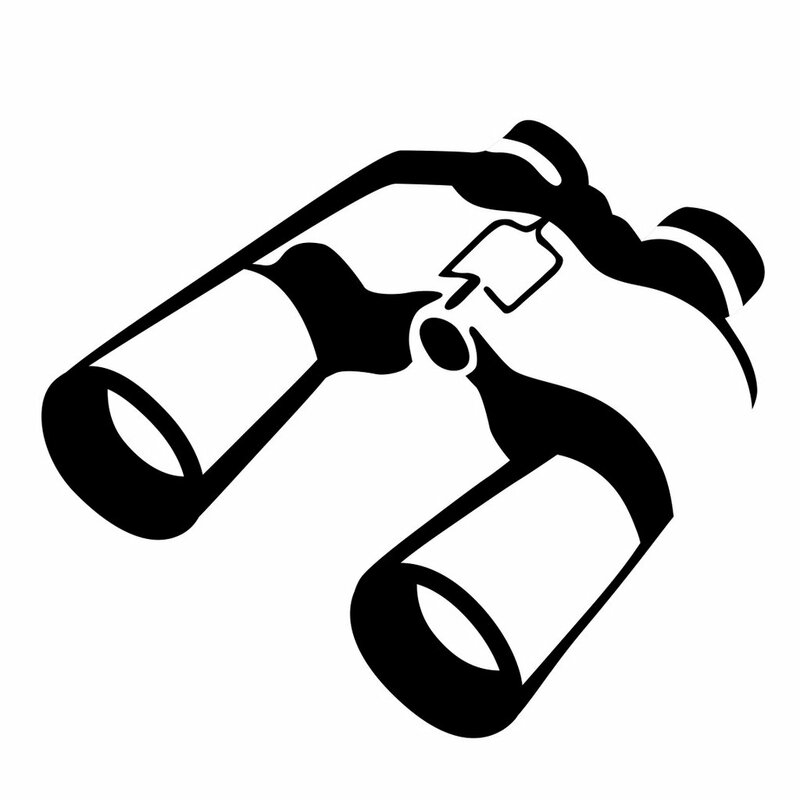 Interesting too that among HP's (NYSE HPQ) 30+ blogs, it was the LaserJet blog that caught Forrester's attention. Who says printers are boring? No, we're not talking about refilled cartridges this time. Seems an Australian study, as reported in today's USA Today and elsewhere, reports particulate emissions from some laser printers that could represent health risks for office workers. The study has yet to be issued in its entirety, but apparently identifies 17 offending models, out of 62 tested. Could this represent one more blow to today's dominant position of laser printers in the office? One of network TV's old tricks for filling the airwaves during less-than-popular viewing times is, of course, the infamous re-run. And I'm not resorting to that for this blog (not yet anyway!). But a more appealing variation is the "clip show" -- compiling favorite moments from a series, putting them together in a somewhat coherent fashion, and packaging them as a tribute or milestone show (eg "let's look back at our first 100 episodes"). Anyway, with summer upon us and a few news bits slipping by, I'm creating my own version of the clip show to highlight a few items we otherwise might have missed. Shelley Solheim had an article in VAR Business just a month ago entitled "Ink 2.0, An End to Lasers?" that features the Silverbrook Memjet and HP (NYSE HPQ) Edgeline face-off. Definitely very much worth reading, as it includes a very thorough analysis with thoughts from Angele Boyd of IDC and also Xerox (NYSE XRX) and their ink-versus-laser perspective. One of this blog's other favorite topics from this year is the Kodak (NYSE EK) EasyShare printer introduction. A few weeks ago, again late June, the company announced expanded US distribution of their All-in-Ones into Office Deport (NYSE ODP). This seems like a big positive step for Kodak's foray into inkjet photo printing, as they had only direct sales (via their Web site) and exclusive retail distribution at Best Buy (NYSE BBY) up until now. As far as their claim of savings of "up to 50% of everything...[consumers]...print" they're still going with it, but follow that with the disclaimer "Actual results may vary", in the first paragraph of the release no less. I think that might be an industry first! And lastly, and more recent, HP (NYSE HPQ) announced two software acquisitions on Monday. Neither is directly printer related, but worth a comment nonetheless. Behind one of the two buys, enterprise software leader Opsware (nee Loudcloud), is none other than Marc Andreessen, of Netscape fame. It seems Marc stands to profit by about $100 million on this deal, which isn't bad, and the company is hardly an overnight sensation. (See John Paczkowski at All Things Digital for background and a great photo of Marc from the past, no less than a Time magazine cover, in his post, "Ops I Did It Again".) OK, the printer connection? As a manager in the LaserJet business at HP a dozen years ago, I went on a small exploratory mission to Netscape in Silicon Valley to discuss printing from the Web. (Yes, this same idea that HP finds itself pushing again.) Anyway, as founder and principal of what was then the hottest company in Silicon Valley, he didn't have to, but Marc himself showed up at our meeting, curious about just what HP could possibly be thinking about. It was a confirming event that kept our small team encouraged, when most wouldn't give us the time of day! Maybe because it's the middle of a long hot summer (at least here in the Mountain West where I live), but it's surprising that I've yet to hear some printer industry optimist praise the huge potential print volumes that will be driven by Apple's (NASDAQ AAPL) iPhone. It's been the tech event of the summer (really the year...anyone remember how the iPhone's original announcement at San Francisco's MacWorld in January was thought to have held back attendance at the competing CES in Vegas?). But so far...silence. I can recall SO MANY instances of some print industry visionary extolling all the pent-up print demand just waiting to be tapped from whatever the latest gadget was starting to take off, from PDA to camera phone. Worrying that I was missing something, I googled (has that verb now been demoted to lower-case-"g" status?) the phrase in this post's subject line, and pretty much came up dry, except for this Machinist post by Farhad Manjoo titled "Why I Returned my iPhone", including a mixed review with some specific knocks on the hardware but more on the phone's much-maligned service (Cingular/AT&T). His reference to printing was actually about why he doesn't need to do as much anymore, and not so much referring to iPhone specifically but mobile devices generally. So, it appears we'll still have to wait for the fearless prognostication about iPhones driving printed pages. Maybe it will come soon. Or maybe it has already come and as noted, I've missed it because I've been distracted. There's that matter of the summer doldrums I mentioned up front, but I'm also distracted because I've got a new iPhone, that I'm NOT returning! It's interesting when on occasion one of the major industry players releases marketing research reports for public consumption. Of course, the motivation of making available expensive and typically proprietary research is normally to prove a marketing point with the help of a theoretically neutral third-party company. This "neutrality" logic fails a bit when thinking it through and realizing the research design, if not the actual results, is commissioned by the sponsoring vendor just to prove their point. But beyond this rather cynical view, it's great to have access to insider research if only to get a glimpse of the methodology employed. Following up on the subject I introduced several months ago, HP (NYSE HPQ) is making available selection of InfoTrends research reports focused around the question of the costs of printing small business marketing materials on an in-house Color LaserJet versus taking the job outside to a print shop. Seven separate reports cover seven countries (Brazil, Cananda, China, Germany, Sweden, the UK and the US), each basically comparing the cost of color laser toner and paper with print-shop prices for different-sized runs of simple marketing materials. And surprise? Doing the work in-house on a Color LaserJet, even with relatively heavy coverage of 60%, was less per image at run lengths of hundreds for an HP Color LaserJet 2600 or up to 1,000 and even more for an HP Color LaserJet CP3505 in many markets. For jobs with light to medium coverage the economic cross-over point is generally well into the 1,000’s. This compares VERY FAVORABLY with my original supposition that in the May post print shops would win out when quantities get into the 100's. However, one way this research falls short is on the breadth of what's compared. The essence of the results can be summarized easily -- in simple one-sided and two-sided marketing documents printed on letter or A4 paper, in-house printing has many advantages, including cost. The charts contained in the reports are interesting because while the in-house costs are coverage dependent, print shop prices are not. In other words, because they charge a flat per-piece price independent of coverage, let the print shop do the larger quantities of the toner-sucking heavy coverage jobs, and leave the simpler, mostly textual jobs for in-house. The reason for going outside, however, is often where media, binding, size, and other challenges have come up, and these reports don't address those jobs at all. The reports also ignore the hassle factor. An example of this is that one of the test documents is duplex, and the HP Color LaserJet 2600N is a manual-duplex-only machine. Meaning it can be done, but requires some intervention, and even a share of good luck at least in my experience! 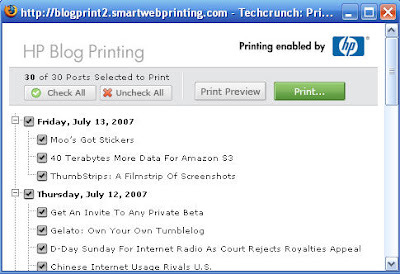 Interesting to note too that TechCrunch is one of HP's (NYSE HPQ) first blog platforms to enable print as part of HP's "Print 2.0" initiative. 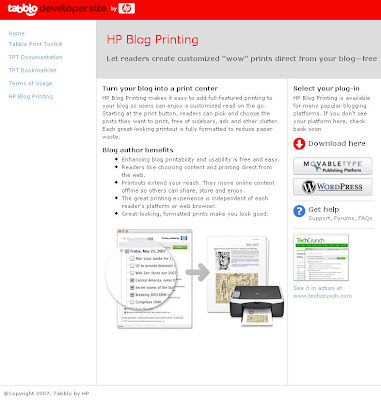 (See lower right corner of "HP Blog Printing Center" screenshot.) TechCrunch seems to be getting the Hard Copy religion! GreenPrint, with the software printing utility of the same name, continuing its effort to save trees by reducing output from the world's printers, recently introduced a new screen and printer font. The company says the font, EverGreen, includes characters "designed to allow more words ... on each printed page without compromising readability… [reducing]… paper use by 15–20 percent." Priced at $10 and available from the company’s Web site, the font is perfectly readable. But some font industry veterans may say it lacks the elegance of the industry’s classic typefaces. And market acceptance? Press and customers have rallied around the GreenPrint utility's benefits (e.g. 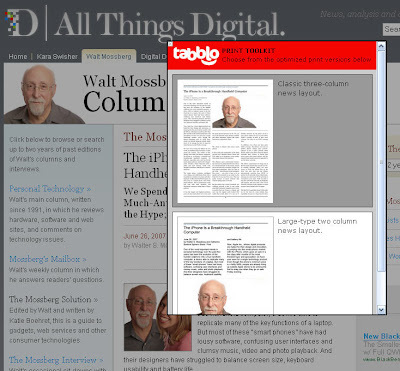 eliminating printing unnecessary pages from Web browsers) which may be more visible and thus more compelling to customers than savings based on using the new font. On EverGreen's ability to address a customer's need to reduce printer supplies waste, GreenPrint CEO Hayden Hamilton says, "While no one is … saying 'If only someone would design a font that allowed me to reduce paper use,' people constantly complain about the amount of paper waste in home and office printing." Hamilton notes the anticipated 'paperless society' has moved in the opposite direction, so EverGreen was developed to switch patterns back towards conservation. Hamilton doesn’t deny that GreenPrint will challenge the sensibilities of the entrenched "old guard" of the font world. "In a way, that is exactly what we were hoping to do. We are certainly not trying to offend anyone, but we are hoping to shake things up a bit. Many of these [existing] fonts were designed a long, long time ago when our priorities as a society were very different. No one recycled, waste didn’t have the same stigma, and conservation as a philosophy was rare. If we were all still driving the cars that were designed fifty years ago, we’d be going through two to three times as much gasoline as we are today, and emissions would be 90 to 95 percent higher." The font establishment’s response? "While the marketing of this font as 'green,' and the importance of environmental concerns are much appreciated, frankly there are many fonts that meet this need, examples of which are Letter Gothic and Arial Narrow," says Rod Acosta, product marketing manager of Printer Imaging for Monotype Imaging. "The key features of such a font are thin upright stems in characters, [which] saves ink and toner and condenses spacing, [which] shortens line length and saves paper. Also, the example of the font I saw seemed to be in need of a bit more hinting on the diagonal stems and rounds especially if used at text sizes at 300 dpi. That said, it’s a pleasant design overall, with the small exception of that unusual diagonal cross bar in the uppercase T, and worthy of consideration by anyone interested in pursuing green or plain economical goals." The future? Hamilton promises more ideas like this, leading the company he founded on its visionary path. Elise Burke, GreenPrint's communications director, says printing and imaging customers and industry press have a positive reaction to green-oriented print products. She sees enormous unmet needs the company will continue to fill. "With this year’s Earth Day announcements from major firms like HP and Xerox, I expect that other vendors will continue to respond in kind." Life Does Not Come With a User's Manual, and, if it did, would it be a PDF file on a CD? Down-home philosophers have used this month's title phrase (and its variations) for both humor and insight, but the topic of owner's manuals is also valuable for exploring the ever-changing role of paper, which I introduced in my June column (Observer, 6/07). This subject also gives me a chance to spotlight another great marketing story in my ongoing series of companies and their ability to identify and satisfy customer needs to achieve success in the printing industry. Historically, I think many people have pleasant associations of cars and their owner's manuals. For example, savoring a detailed owner's manual for a newly purchased Cadillac could be one of life’s great pleasures. However, the growing list of optional feature sets for automobiles led to a classic print-on-demand opportunity. High-end automobile manufacturers replaced a lengthy, confusing manual that includes every variation of features available for a particular model with a customized, personalized manual tailored to each owner's specific car. Early models of technology products such as printers, cameras, and scanners also came with lengthy and often obtuse owner or user manuals. Today's information technology manufacturers, at least those that cater to consumers and small businesses, have adopted a simple "getting started" map-like sheet as the only hard-copy document and have relegated reference materials to a PDF file on a software CD or DVD. In the technology area, these so-called "soft copy" manuals that video game and software manufacturers have also embraced have been good for business. Bulky physical manuals take up space and add cost, so excluding them in a variety of products allows manufacturers and resellers to maximize valuable shelf space and reduce shipping dollars. In addition, consumers do not seem to mind the lack of hard-copy documentation, at least not enough to make a big fuss. The move from stuffing a big printed manual into the box to including a PDF version on the requisite software CD could be cited as a great, shining example of "print and distribute" moving to "distribute and print." In my personal case, however, the move could be more aptly described as "distribute and then possibly print," as using an online instruction manual definitely has its advantages. It is more natural for a user to look up a question online than it is to keep track of a CD after the product packaging has been discarded. A Google search is less hassle and has the advantage of retrieving the latest product references. Ironically, with all the talk of moving away from paper-based manuals, I know of at least one example of an owner's manual moving back to hard copy. Alexander's Print Advantage of Lindon, UT, is a 28-year-old commercial print shop that has partnered with AxisPointe, another Utah-based firm, to produce customized homeowner's manuals. AxisPointe created the concept and markets the manuals to homebuilders in all 50 United States. AxisPointe has an alliance with CountryWide Financial Corporation to provide advertising that helps defray the cost of the manuals. Each homeowner's manual contains the home's floor plan, restrictive covenants and requirements, and contact information for every subcontractor and manufacturer who worked on the home. In addition, the manual includes the model number, a color sample, and the warranty care and use information for all of the home's contents. As a result, the manual meets the homeowner's need to have all of the home's important information conveniently located in one place. Alexander’s has experience with other visionary print-on-demand projects, including the firm’s foray with FranklinCovey Corporation and a design-your-own personal planner product. When asked about his company's ability to win these deals, Jeff Alexander, founder and president of Alexander's Print Advantage, says, "It’s all about technology, and not just the hardware." According to Alexander, differentiators include the company's bindery capabilities, workflow automation, and integration with its hardware base, which includes equipment from HP, Océ, and Xerox. As a result, Alexander says that his firm can better satisfy its partner/customer and end users when compared to the competition. But this month’s example is not a pure “paper wins out in the end” story. Homebuilders include a CD with the manual, as well as Web links to related information. The printer industry is learning that today’s world includes mixed media, and companies need to accept this fact and take advantage of it, just as Alexander’s Print Advantage delivers to homeowners the whole package that includes print and electronic versions of the AxisPointe homeowner’s manual. On a mostly-up morning for the markets starting out the new week, Lexmark (NYSE LXK) has issued a warning that their second quarter numbers due out July 24th will disappoint. Their stock has responded with a 9% drop to below $45 less than an hour into the trading day, and even print leader HP (NYSE HPQ) is weaker, down 1.3% at $45.38. LXK's release attributes the revenues/earnings problem to "the usual suspects" (my emphasis added), all except for that last one -- I'm not sure what that means. This shortfall is primarily due to less than expected inkjet supplies revenue, lower hardware average unit revenue driven by aggressive pricing and promotion, some greater than expected product costs, and greater than expected branded inkjet unit growth(?). HP (NYSE HPQ) didn't get all that much press and analyst attention from their early June "Print 2.0" announcement but maybe that's understandable. The summer has started, they were competing with some big stories elsewhere in tech-land including the D5 conference and the iPhone, and also, let's face it, web printing can be a bit of a difficult subject to convey, and I speak from years of direct experience! But, I see hope, definitely! The Tabblo acquisition which I originally covered in the Spring has yielded the Tabblo Printer Toolkit (TPT) which I've now had a chance to play with, and I like it. One of the first things to strike me (see red-bordered screen shot) is simply the order that HP presents browser plug-in instructions -- first Firefox, THEN Microsoft IE, then Safari. Yes, HP, there's a whole world out there beyond Microsoft! And OK, it may simply be alphabetical order but it still represents significant openness on HP's part, at least in my book. (BTW my own personal market share tally -- based on visits to this blog -- is lately about 65/30/5 for MSIE, Firefox, and all others including Safari.) And something else small but still important? Included in the example web sites offered for trying TPT where "harvesting recipes" have been written, in addition to CNET (see top screen shot) and other more serious sites, is The Onion, a favorite humor web site that I've been lucky to know about the last few years because I have kids in college. (Yes, there is an ROI!) Message to HP -- it's ok to have a sense of humor! 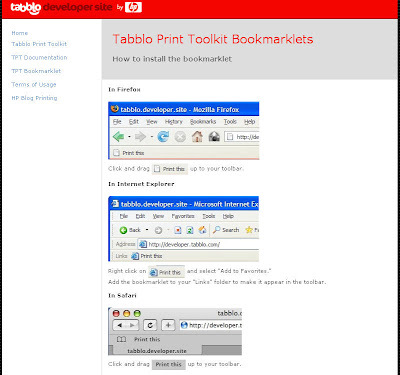 The Tabblo Print Toolkit is limited, as can be expected at this stage, and also seems to reveal HP's ongoing balancing act between marketing objectives of truly satisfying customers and business objectives of selling more and more profitable printer supplies. The example in the screen shot shows the two options for printing an iPhone review (can't we escape?) by Walter Mossberg of The Wall Street Journal and their great techy web site, All Things Digital. We all love Walt but do we really need the "large" and "extra large" full color photo options of his head shot? Seems to me that a nice clean monochrome text version of the review would suffice for just about everyone. More soon as I continue to my hands-on journey with the TPT and also as a beta site for their upcoming Blogger print button (for now check out Techcrunch for a good demo of the idea). And then there's HP Smart Web Printing, which is a plug-in that goes back to an MSIE-only world but has a very interesting pedigree that I'm anxious to explore. Stay cool during this summer's heat wave (at least for my US readers) and tune back in soon! From a new one to me, Gadgets Blog, comes last week's post about five new printing-related technologies. Included are Memjet and Zink, no strangers to readers of this blog, but we also see a projection/printer hybrid (as far as I can tell), and implementations of the long-discussed reusable paper and wall-mounted printer. Worth a look! I wanted to give one final tip of the hat to a landmark blogging event for the printer industry that recently appeared online and that I feel is worth noting one more time. It's now been over a week since the fast-moving group over at the Databazaar Blog put together their "Printer Pundits Week" feature, five days with five different interviews with printer industry analysts and executives commenting on the industry. 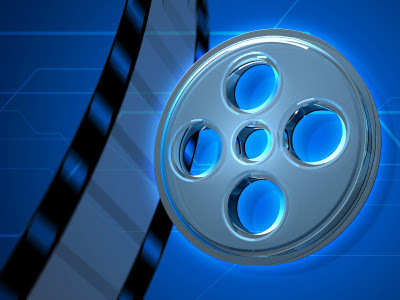 In case you missed all or parts of it, it's definitely worth your while to check out the week's comments and predictions, including those from Vince Ferraro, VP Marketing of HP's (NYSE HPQ) LaserJet business unit, Art Diamond of The Tiara Group, Andy Lippman of Lyra Research, and M. David Stone of PC Magazine. It was quite a thrill to be included on my own day and especially to be in such distinguished company. Again, thanks to the Databazaar blog crew and really hope this becomes a regular event!